Today on this job page you will get a job offer from PRIMACO Islamabad Jobs 2018 Online Application Form Download. Pakistan Real Estate Management Company is looking to hire the adroit, calibre, hard working and well-disciplined applicants are required to apply for the following posts given below based at Islamabad only. 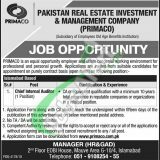 Jobs in PRIMACO Islamabad are entitled as (Chief Internal Auditor) are the vacant positions to apply as soon as possible. These posts are for a senior level and based at Islamabad. So guys if you are interested and having the great interest to apply for such a job so you are welcome to apply and get employed as soon as possible. Now, I will let you know about its further details. The overall qualification which is required for these posts is CA or equivalent qualification with 10 to 12 years of experience in the relevant field is required to apply. Applicants meeting criteria may download the application form from www.jobsalert.pk. Application form along with detailed CV without any document should reach the following address given below. The last date for applying is March 25, 2019. Competent authority reserves the right to accept or reject any application form. For all types of jobs stay tuned with this job page to get more and more jobs. Last Date For Apply: March 25, 2019. Address: Manager (HR&GAD), 2nd Floor, EOBI House, Mauve Road, G-10/04, Islamabad.